TO TRUSS A TURKEY FOR ROASTING. 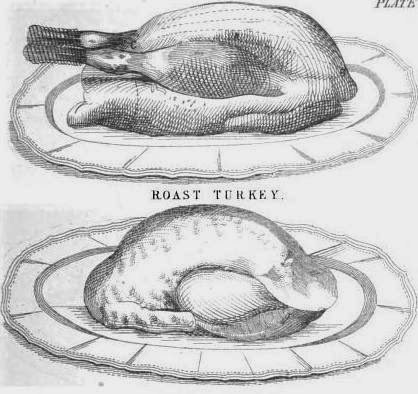 Having prepared a turkey (as directed for cleaning), fill the crop with fowl stuffing, and fasten the skin with a small skewer on the back; turn round the wings on the back, and skewer them; thread a trussing needle with kitchen cord, and fasten the legs quite close with it, when it is ready to cook. See Engraving, first image. A turkey, when to be boiled, is trussed with the legs pushed into the body; this is performed by cutting off a good portion of the leg bones, and pushing in the legs into the body. It is trusted in every other way, as for roasting. See Engraving, second image. Having singed a turkey, and drawn the sinews from the legs, cut off the head and neck, and leave four or five inches of the skin of the neck, as will be seen at directions for drawing a turkey. Turn over the turkey on its breast, and cut up the skin right up the centre of the back towards the neck. Pause and think well of what you are to be about. You are to remove the skin and flesh in one entire piece, leaving a skeleton of the bones. Take a sharp penknife, and scrape the meat entirely from the bones, beginning at each side of the back, down to each side of the breast, leaving the last bone of the leg and the last two joints of the wings. It is necessary to leave them untouched, as it is difficult to put them into the natural form again. When the bones have been removed, sew the turkey half up with strong thread. [Stuffing] Have an ox tongue boiled, skinned, and the bones and coarse pieces of the root removed. Spread veal stuffing to the thickness of half an inch all over the inside of the turkey; put the tongue into the turkey, with the top into the heart, and the point downwards. Sew it up, and put the skin of the neck over the back, and sew it down in the usual way. Turn it over and truss it for roasting. Instead of the tongue, three pounds of pork sausage meat, mixed with half a pound of grated bread, seasoned with white pepper, salt, and, if liked, a few sweet herbs, may, be substituted. It is used cold. Small fowls are sometimes boned and stuffed, with pork tongue boiled, or sausage meat. When for company they are glazed and ornamented.